Since the sun moves in a regular and predictable manner it can be used as a calendar. The simplest would mark the solstices, 6 months apart. By counting the number of days between the solstices and halving the number the equinoxes can be found. (See note 1). Halving again gives the 'quarter days'. Thom suggested that these humps (i.e. observed directions) were evidence of a prehistoric solar calendar. If the number of days between the solstices (red lines) is halved we obtain the equinoxes (red dashed line); halve again the ‘quarter days’ (orange dashed lines). A further subdivision (blue dashed lines) then gives eight nearly equal divisions between the solstices or 16 divisions of the year, each of about 22 or 23 days. Such a solar calendar could conceivably have been put together for a fairly simple agricultural society but one with several important religious festivals, particularly at the ’quarter days’ – the half way points between solstices and equinoxes. One would certainly expect that it was some kind of religious specialists who constructed the calendar and organised the festivals. 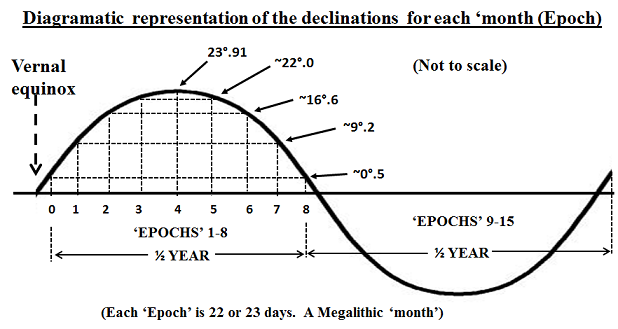 It is of particular interest that the declination found for the equinoxes is not 0⁰ (the modern definition by equal length of day and night) but at about +0⁰.5 . The Earth is in a slightly elliptical orbit round the sun and so the two halves of the year by days are not quite equal. 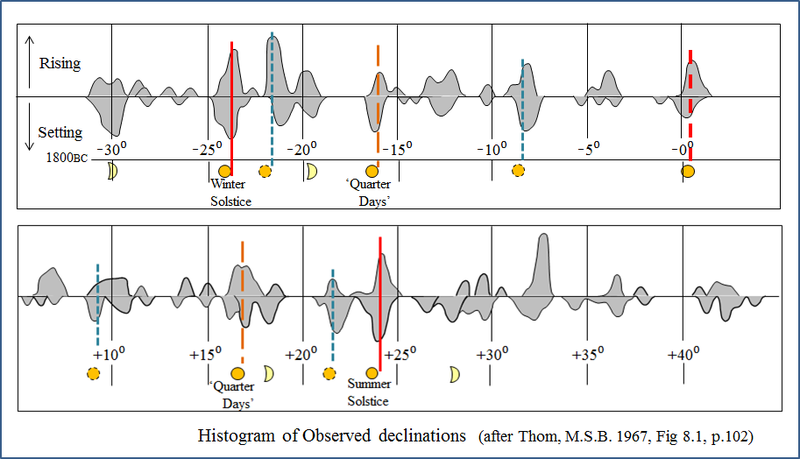 The declination (+0⁰.5) observed is strong evidence that it was found by counting days. Note that the declinations at sunrise and sunset differ, which is the result of the sun's movement north or south. Note also that there is a significant range of declination, especially near the equinoxes. 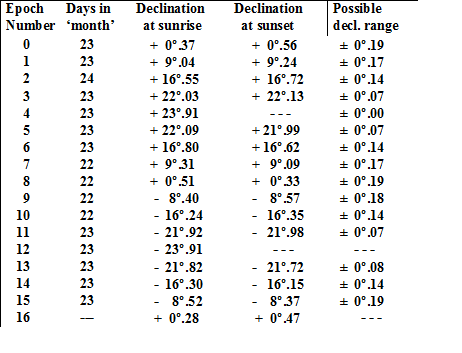 This represents the sun's changing declination on a given date over a four year period. The declination of the day concerned then reverts back to the beginning of the range. Note 1 The true equinoxes (equal day and night) are when the declination of the sun is 0° declination. The Earth is in a slightly elliptical orbit such that it is slightly closer to the sun in (northern) winter than in summer. Therefore it moves slightly faster in winter and so equinox to equinox through winter is shorter by about 2 1/2 days than the summer half of the year. Hence the diagram above. In ancient times the general movements of the sun, moon and stars would have been familiar to everyone. The sun and the changing seasons would have been important and particularly so as farming became more common. Certain times of the year would have particular importance. E.g. the end of winter, the start of summer, harvest time, and the end of summer. These would appear to be marked by the quarter days. Lughnasadh: Wedding of the Sun god Lugh to the Earth goddess causing crops to ripen. Samhain: Summers end; preparations for winter. The early missionaries would have been aware of the importance of these times (and the solstices). It was natural therefore to adapt important events of the Christian calendar to them. A theodolite was used to measure the bearings and altitude of skyline features in the indicated direction to better than 1ʹ arc. North was determined by the sun method. The azimuths and altitude were drawn on an image of the region and the rising/setting path of the sun/moon for relevant declinations plotted. Foresights for specific declinations were found in all cases where there was an indicated direction and clear horizons. The foresights found were typically within ± 2⁰ of the indicated direction, well separated from other features and are considered to be those used when the alignments were set up.